This weekend I, like many of you, read about The Adventure of Django Unchained Actress Danielle Watts Out and About in Studio City. Watts was making out with her celebrity chef boyfriend in their car when they were approached by cops. They asked her for ID and asked questions intimating they thought she was a prostitute. 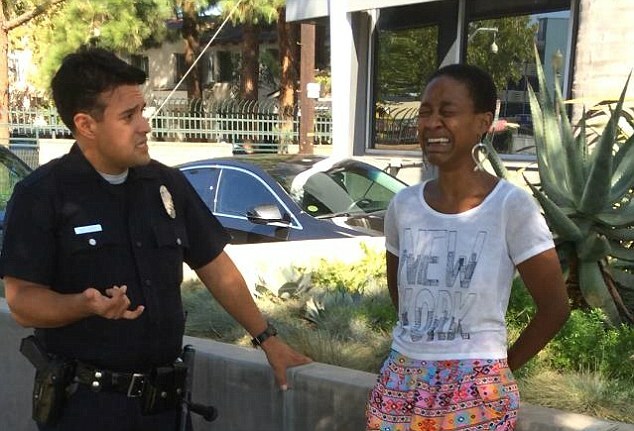 When she didn’t hand over her ID, they handcuffed her, put her in the back of a squad car; and eventually released her. I read this story; and became very sad. Because despite the best efforts of The Oreo Experience, Intl, LLC, ESQ, sometimes people forget some of the basics. Danielle did a lot of things right (white boyfriend, hanging out in Tony neighborhood where the average home price is $1.1 million) but she also made some classic mistakes. Can you spot them? I’ll give you a minute. Eyes on your own paper! Maintaining long hair as a woman of color takes a long time and goodly amount of dedication. Your long flowing locks will make it clear that you don’t have time to take on a second job as a prostitute. It’s also in line with pretty standard Western beauty standards. Showing that you’re not afraid to not conform also shows that you’re not afraid to not be breaking laws. When someone endures the time, money, and third-degree burns necessary to fit in perfectly, you can be much more assured that they don’t want to cause trouble. Sure New York City is home to great museums, priceless works of art and brilliant architecture. But it’s also super diverse and sung about by rappers. How are police supposed to know that you’re paying homage to The Big Apple because you really love Art Deco buildings or because you’re in line with Mr. Beyonce? You can still wear shirts that announce one’s love of cities, just make sure they’re the right cities. For example, I love sporting my “Wisconsin is for me!” or “Omaha is lovely this time of year!” or “I sure do enjoy Salt Lake City” tees. Short shorts are totally ok, but we need to tone down the colors. The orange and purple and bold patterns are reminiscent of some African tribal prints (which I only know since I have done the scary research so that you don’t have to). Didn’t show the cops her ID. Everyone knows that the best, safest, most secure and sincere way to show your love just how much you love them is in the dark. And maybe in separate beds. Pennings sonnets. Praying for redemption from your lust. What do you think? Justified stop or something else? Have you been pulled over for silly reasons? How did you get out of it? Or are you writing from jail? If you are writing from jail, it is one of those nicely lit ones like on OITNB; or one of the scary jails from that SpikeTV show JAIL?